Description of "India Coffee Stories (eBook)"
India Coffee Stories - a 1000 hour crowd-sourced book project with over 100 co-authors. It is a book about the amazing things that happen to people at coffee shops. People meet at coffee shops for many reasons. Perhaps it is to find true love, close a business deal or to reconnect with an old friend. Anything is possible. India Coffee Stories is sponsored by Steve Kantor. Steve is President of Lifebushido, a U.S. based company. He met with co-authors and special guests at coffee shops in New Delhi during Summer 2013. 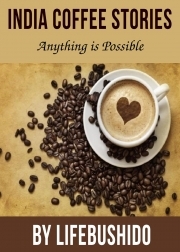 Lifebushido’s vision - Anything is Possible - is far greater than India Coffee Stories. Are you the 1 in 1000 people who dream of making a positive impact on the world via business? Do you share our vision? Do you believe that anything is possible? Steve Kantor believes that anything is possible. He would like to meet you for coffee and help you achieve your dreams. Reviews of "India Coffee Stories (eBook)"